The first 4 shifts at Brookside Gardens’ Wings of Fancy in August were not as hot as some of the shifts in July and I settled into the rotation. The discovery station always seemed to be the most crowded hour of the shift. There is so much there: butterflies emerging from chrysalises, plants that butterflies are laying eggs on, and touch samples (laminated butterfly wings for young children…butterflies that have succumbed for adults and older children). Before the 11th shift, I was a little late and only had time to take a few pictures along the walk up to the exhibit…but one was a Monarch butterfly; they’ve become rare enough to be a little celebration every time I see one. 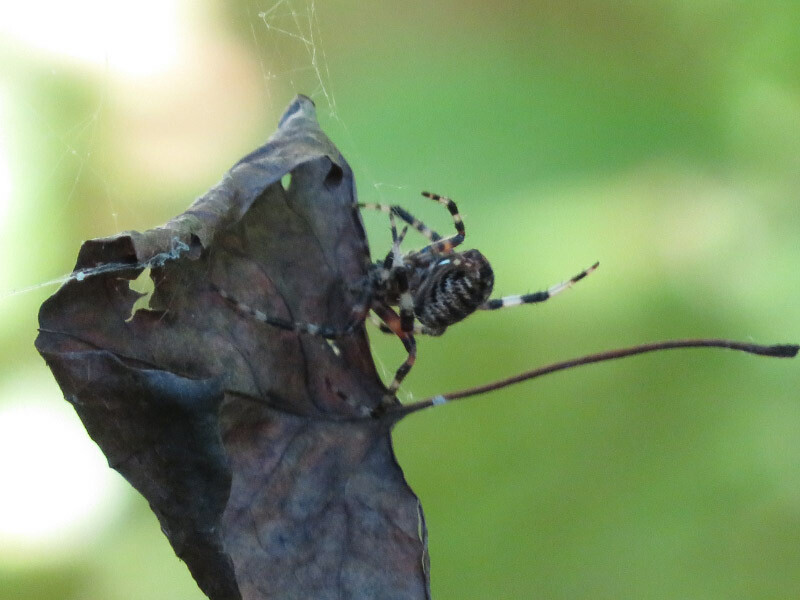 The little hike before the 12th shift was on the nature center board walk where I saw a spider excise a leaf that had been blown into its web; it was a neat job and the web was left intact. A beetle was crawling down one of the big trees. And some odd growths on a bald cypress (fungus?). And flowers in a wet garden bed. The 14th shift was on a bright and sunny day. I went overboard with pictures! There a spicebush butterfly fluttering around the rose garden – this is one of the few images I got that was not blurred with its motion. The roses in the garden were covered with water droplets from morning dew…somehow I like the flowers even better with the droplets. There was a goldfinch enjoying one of the other plants. It contorted itself to get ‘the goodie’ from the plant. As I walked back toward the conservatory – a Monarch butterfly was enjoying some flowers…and I zoomed to focus on how it was using its proboscis. Previous posts re Volunteering at Wings of Fancy: prep, I, II-IV, V-X.